My name is Skittles and if you’re looking for love then look no further! 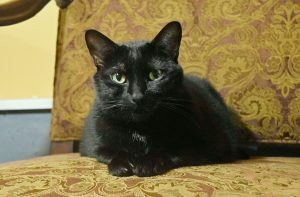 I’m a quiet and spunky 3-year-old girl who takes a moment to get used to new people, but bonds very quickly after that. My favorite things in life are good company, good petting, and good food, though that just scratches the surface (or my chin, please). 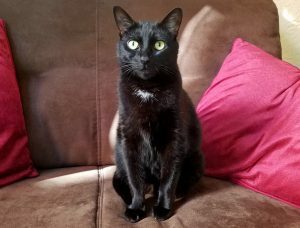 I was adopted as a young kitten and lost my home after my adopters parted ways and neither were able to care for me any longer. Losing my home and my family was hard, but I’m more than willing to build new relationships with caring folks. Since I’ve been an only cat my entire life, I’m not used to other cats being around and I’m not a fan of them. Given the space and a day or two to settle in, I’ll quickly show you how companionable, playful, and delightful I am! 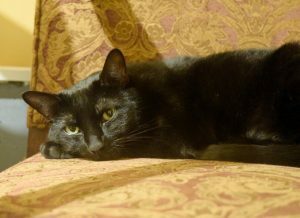 Do you have a kitty-free home that needs a girl like me to sweeten life up? I’m currently living in a foster home, so fill out an application to meet me! I come to you spayed, vaccinated, and micro-chipped for an adoption fee of $100.